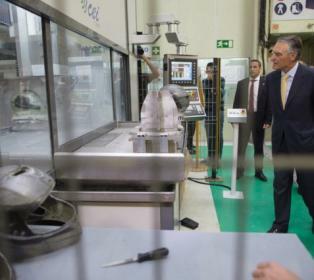 Last October, His excellency the President of the Portuguese Republic, Mr. Aníbal Cavaco Silva, visited CEI, manufacturer of CNC machines that use water jet cutting technology. Besides the standard manufacturing line, CEI manufactures special machines and has developed, in cooperation with Fagor Portugal, a 5-axis machine equipped with the CNC 8065 for composite material cutting using a 38,000 bar water jet to run the finishing operation on helmets for motor vehicles. This project involved several functions that simplified and help the operator in other tasks like the RTCP function, the definition of incline planes, virtual axis, retracing handwheel, search of last execution interruption point for adjusting the virtual axis and customization assisted by a bar code reader. The machine has a gantry architecture with 2 rotary axes on the tool and a rotary table with 4 pallets; it uses the virtual axis system of the CNC 8065, developed by FAGOR for adjusting the distance between the tool and the irregular cutting surface. The virtual-axis feature lets the operator quickly adjust the cutting path without CAM assistance or the need of post-processing a new program for each new adjustment. This way, the CAM does a theoretical calculation of the cutting path on the complex surface of the helmet considering only the contact point of the water jet and later adjusting the distance between the cutting point and the part, depending on several factors, especially the tool dimension and the part restrictions so the resulting cut is as efficient as possible. The operator detects many of these restrictions and, therefore, they are adjusted on the machine easily and quickly. Due to the high complexity of the technical design of the parts to be machined, they also use all the time the definition of incline planes to apply rotational corrections to the entire program in order to fine tune the part zero and make sure that the tool paths are executed at the exact points. In order to better adapt the machine to the customer’s manufacturing process, a bar-code reader was added as well as customizations to prevent the operator from making mistakes when selecting the helmet models to be machined, because, due to the continuous customization of the models and the large catalog offered, it may require machining several models the same day and, therefore, the risk of operator error may be high. Thanks to the state-of-the-art technology available at Fagor’s CNC 8065, it has been possible to solve the various difficulties of the project, especially thanks to using the virtual axis which together with the usual flexibility and programming ease of Fagor CNC’s made it possible to not only meet the initial expectations of the project but even exceed them.